Miniature: Tempera, ink and gold on vellum. Leaf: 506 x 365 mm. A Virgin Saint being crowned at the moment of her martyrdom. 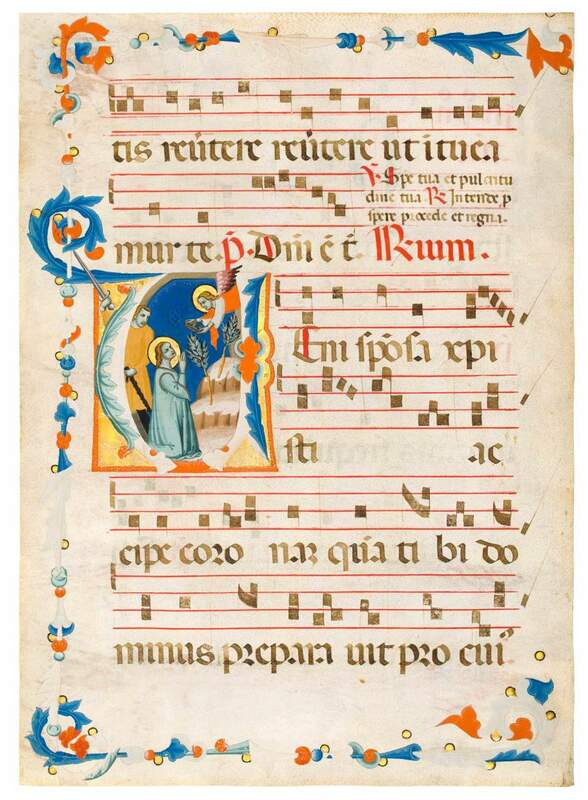 Historiated initial V on a leaf from an illuminated choir book (Sanctoral). Text for the Common of the Virgin Martyrs: Veni sponsa (Come, o bride…) based on the Song of Songs 4:8. The illuminator was formerly known as the Master of San Giovanni Fuorcivitas. The artist represents a young woman with a delicately shaded blue-grey face, kneeling with her hands clasped in prayer, and gazing upward to an angel that descends towards her. The angel holds out the golden crown of martyrdom to place on her head, as a soldier is ready to strike her down with his sword. This leaf comes from a splendid choir book that was painted by a bold and innovative illuminator, whose hand is also found in, among other books, two marvellous classical and botanical manuscripts. Such commissions reveal iconographic innovations and show that this talented artist was much sought after by learned patrons. The present scene has the austere simplicity of 14th-century liturgical illumination, but with intricately detailed features. The use of blue-grey tones for flesh imparts calmness to the virgin's facial expression. The artist balances this calm against the implied violence of the scene. The focus is on the fine, saintly figure, not on the soldier whose sword is kept outside the letter.